Barbara Gonzales was born in 1947 and is the oldest great-granddaughter of Maria Martinez. Maria gave Barbara the Indian name Tahn Moo Whe which translates to Sunbeam. 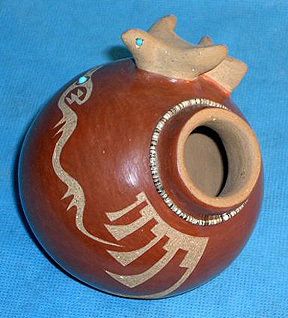 Barbara worked alongside Maria and her grandmother Santana and learned the traditional ways to create black-on-black pottery. But eventually Barbara began her own pottery style creating etched black, red or duotone pots with inlaid turquoise. She has become very famous in her own right and continues to win numerous awards. Barbara traditionally adds spiders to her pottery with an inlaid turquoise stone as the body. The spider symbolizes good luck.